To some cavers, sporting trips are the main aim in caving but to others, digging and exploration are more important. The Club has a long reputation for discoveries in Derbyshire and Yorkshire, albeit minor ones in most cases, and members are still digging some of the old chestnuts such as Rowter Hole and Nettle Pot. The feeling on walking into a new piece of cave where no one has been before and which no one even knew existed is beyond description. 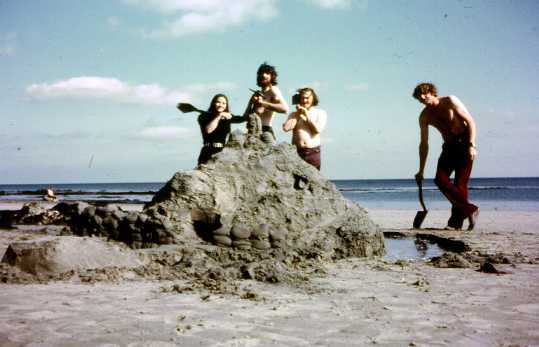 Digging is a very personal activity and relies on the initiative of individual members so if this is your interest, you need to get to know the Club and find out who is digging and where. Referring to the old Club publications and records can be a useful starting place. These are some of the DCC projects over the last 40 years. 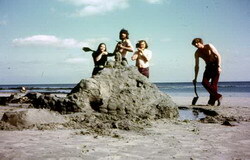 Other projects such as the futile dig on Douglas (IOM) beach, pictured right, were not successful enough to be counted!